Put a new spin on traditional water sports at the only cable park in Las Vegas. 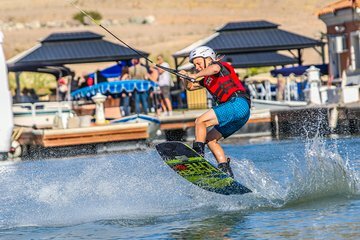 Hit the private, full-service lake and test out a 10-15 minute session of wakeboarding, tubing, kneeboarding, or skiing. All levels are welcome, and first-timers can partake in free introductory lessons. Bring your own equipment, or upgrade to rent helmets and riding gear at an additional cost.